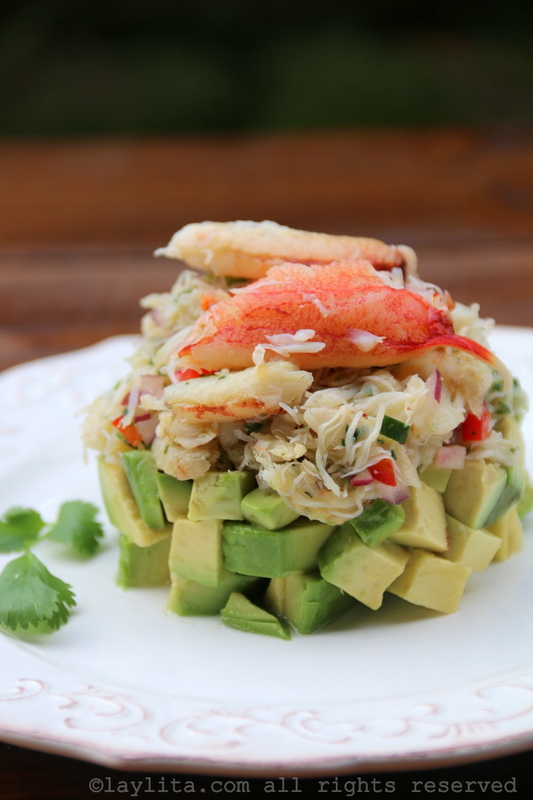 Today’s simple but delicious recipe is for crab avocado stack salad. 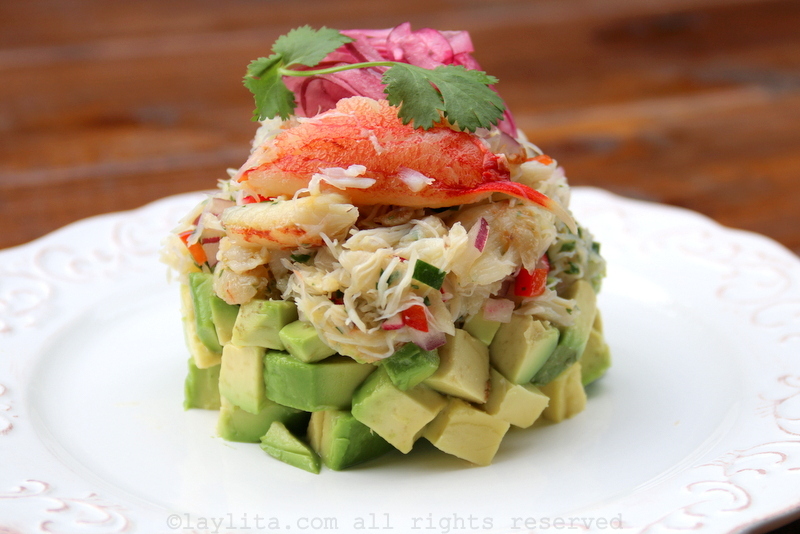 This refreshing layered salad is made with avocado, drizzled with lime juice and olive oil, topped with a layer of fresh crab salad. 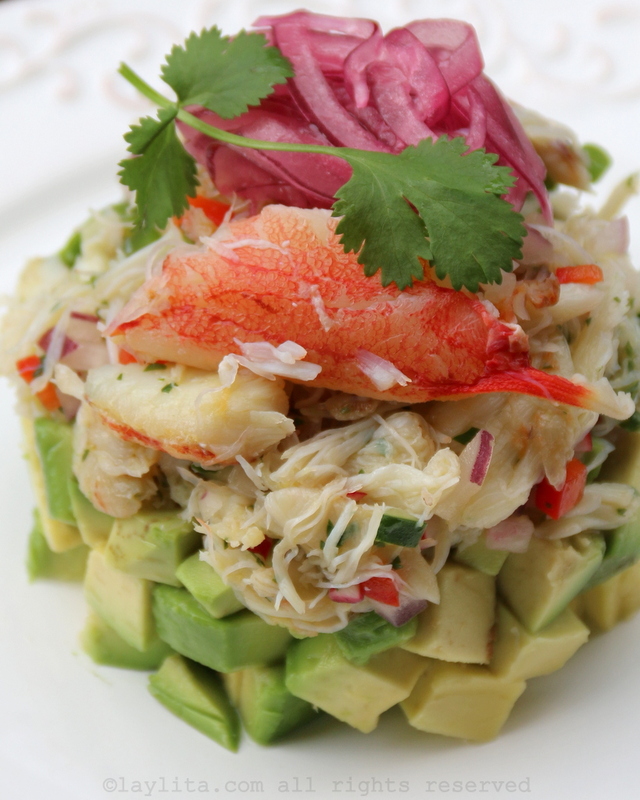 As an optional garnish you can also serve the crab avocado stack with some pickled red onions – aka cebollas encurtidas. The crab salad is full of flavor on its own and is made with fresh crab, bell pepper, cucumber, onion, radishes, cilantro, lime juice, and olive oil. These fun layered stacks work great as an appetizer. Half of the work, ie the crab salad, can be made ahead of time. Just keep it refrigerated until you are ready to assemble and serve. I drizzled the diced avocados with a bit of lime juice – lemon juice is also fine – and olive oil, plus salt to taste. This is both for flavor and to prevent them from oxidizing. If you wish you could add a layer of salad greens as the base. Another option, especially if you want a more filling salad, is to add a layer of rice (or quinoa) before the avocado layer. You can also make these avocado stacks with different types of seafood: shrimp, langostinos, lobster, octopus, canned tuna, or even leftover grilled salmon. I diced the avocados, but you can also mash them lightly if you prefer a creamier texture. For a spicy variation add some diced spicy peppers to the crab salad layer. 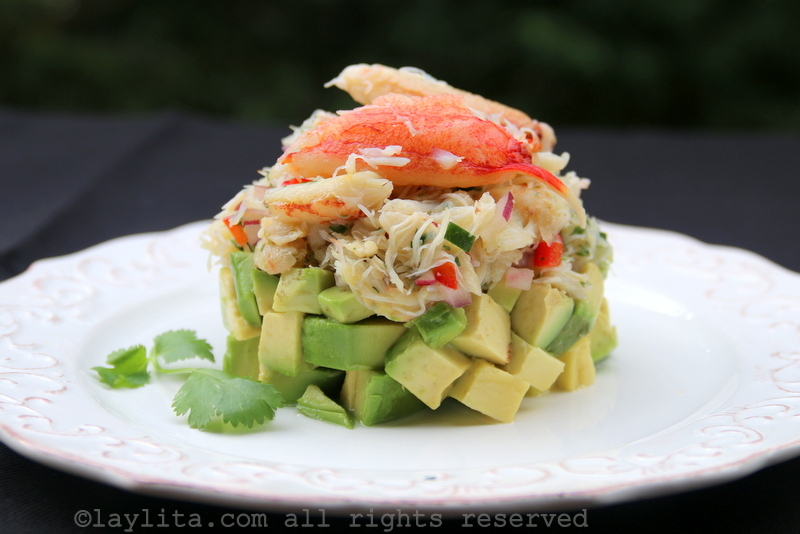 Recipe for an easy and delicious crab avocado stack salad, made with layers of avocado and refreshing crab salad that is made with fresh crab, red onion, bell pepper, cucumber, radishes, lime juice, olive oil, and cilantro. In a large bowl combine the cooked crab meat with diced onions, diced bell peppers, diced cucumbers, diced radish, and chopped cilantro. Mix well. Add the lime juice, olive oil, and salt/pepper to taste. 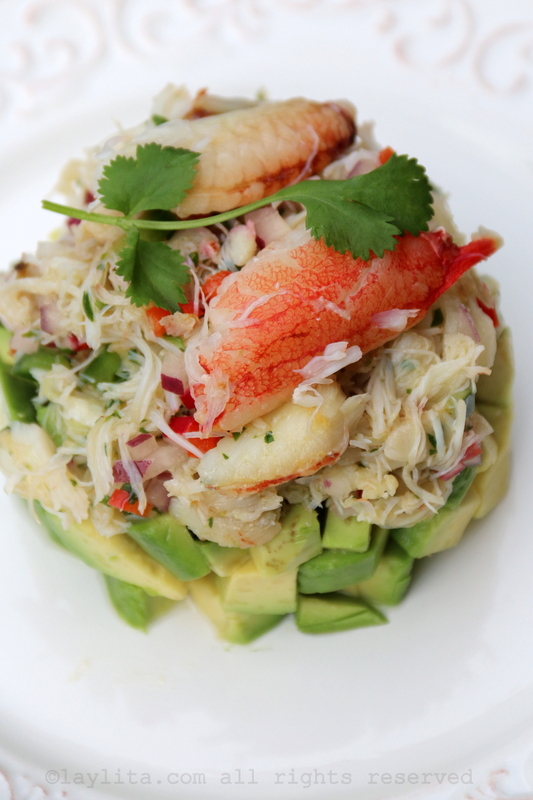 The salad can be prepared in advance and kept refrigerated until ready to assemble the crab avocado stacks. Dice the avocado, drizzle with lime juice, olive oil, and salt. You can keep the avocado diced or gently mash it for a creamy layer. Place a lightly greased round mold on the center of the plate, add the avocado layer first, gently press down (with a spoon) to make it as compact as possible. Next add a generous layer of the crab salad. Press down and then gently remove the mold. If you saved some of the lump pieces of crab, add these on top. You can also garnish the stacks with cilantro leaves and red pickled onions. 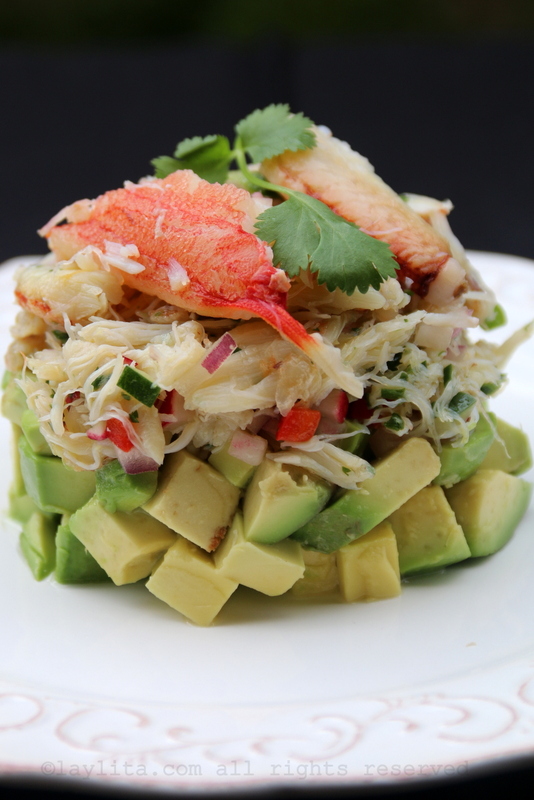 For a more filling crab and avocado stack you could add a layer of rice as the first layer. For a spicy variation add diced jalapeños or other spicy peppers.